For a minute...please indulge our ego a bit here. In that world, this is how we picture the reaction behind the scenes at Big Debbie's House - a Champaign-Urbana-based blog focusing on local politics to us at the Truth Team. While she may call us "hacks" (Hey! We've been called worse, right?!?! ), she at least "gets us" even if it just a little bit. 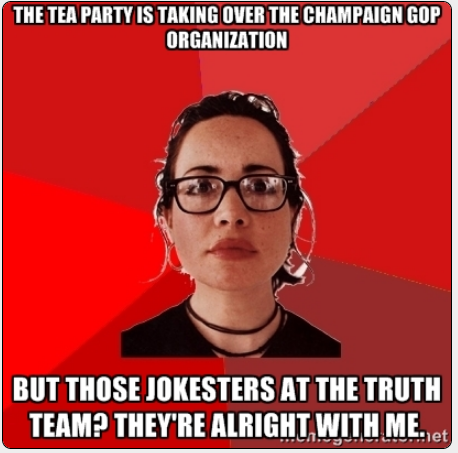 In her Friday "Open Thread", Big Debbie mused about the Tea Party-ization of the local Champaign-Urbana Republican Political Establishment and used the candidacy of Erika Harold as the latest prism to examine that development. She points to some of the Herman Cain stuff and the Family PAC endorsement. All fair points. Then...in her comment, she also tips her cap to our Jurrassic Park Meme on the subject. Here's the meme she is talking about. Glad you enjoyed, it Big Debbie. We're thinking we're going to be seeing more of you in the coming months. Looking forward to it... See you on the trail, Big Debbie!